Reichsführer Heinrich Himmler was clear in his own mind that since the summer of 1944 that the war for the German side was lost and could no longer be won, he sought - on his own initiative, against Hitler's wishes - in a separate peace with the Western powers. 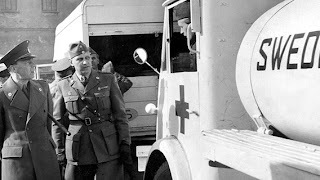 Himmler's hope: Perhaps the internationally recognised Red Cross could be an opener for negotiation with Britain. The situation in the women's concentration camp Ravensbrück in the final weeks before the liberation was full of contradictions and absurdities. 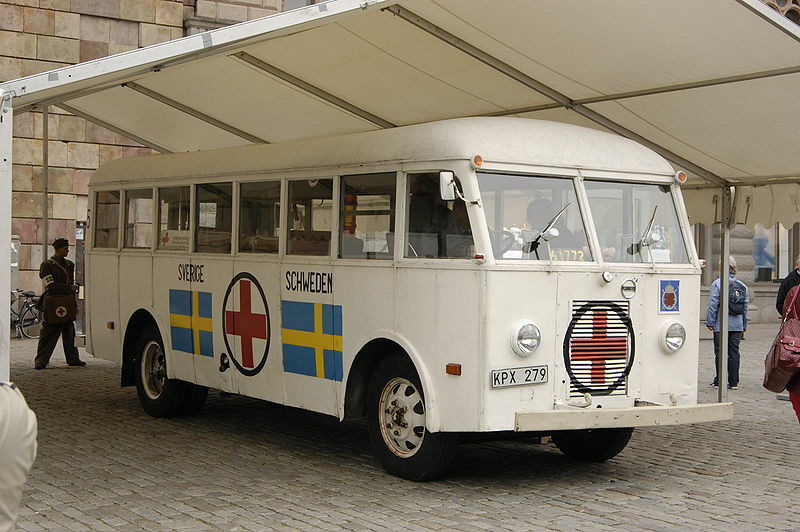 While SS-Doctors had their last victims herded to the gas chamber, white buses of the Swedish Red Cross drove through the gate to accomplish in a unique action to take and save several thousand prisoners through occupied Denmark to Sweden. caught in a dilemma: "A few meters from where they were trapped, they, to their amazement could observe the whole scene through the windows what was developing. 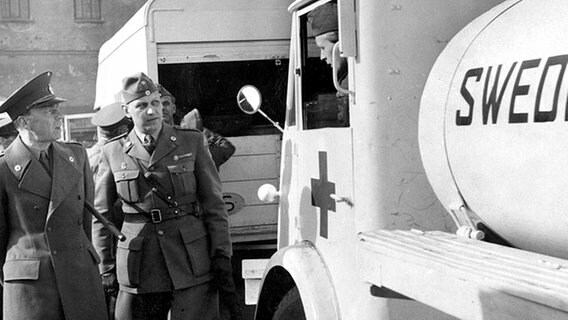 And at that very hour a white-painted Ford of the Geneva International Red Cross passes the entrance to the camp. The Swiss doctor, who heads the mission begins his first attempt in the negotiations for the exchange of 300 French prisoners ". Besides the Scandinavian females it were French, Belgians, Luxembourg, Dutch girls, and Polish women, among them were some Jewesses. On 21 April the representatives of the Swedish section of the World Jewish Congress, Norbert Masur, met together with Himmler. 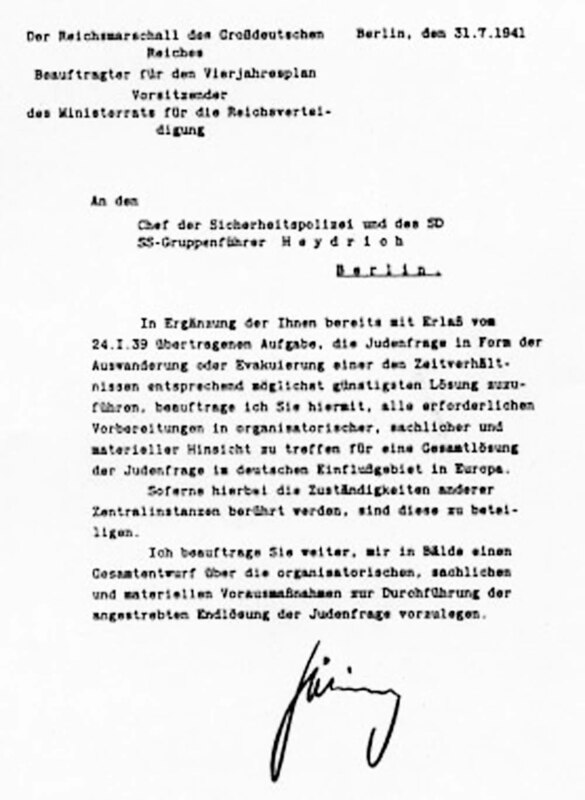 Masur was able to persuade Himmler to release 1,000 Jewish women. The Reichsführer SS, however made one condition that the Jewesses would officially classified as Poles. [his pride was saved.sic] The action took place within a few days. In the transport, on 25 April which left the camp, there were also about 30 small children. 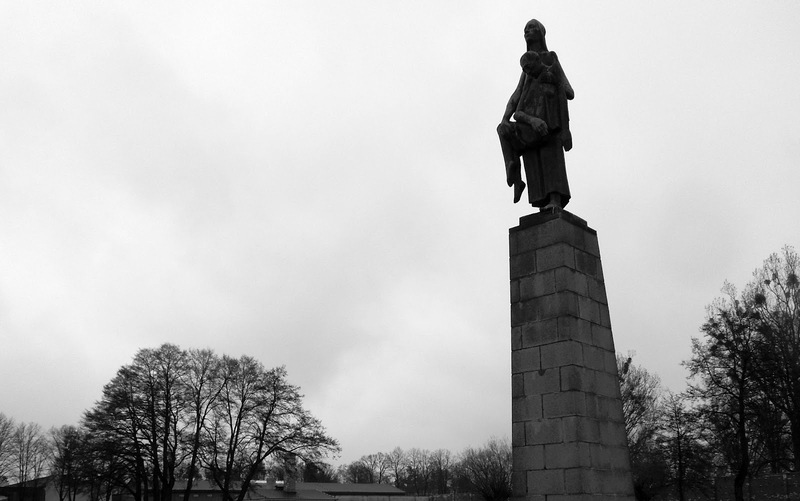 On 26 April 3960 Polish women were finally able to be released from the camp. They were brought by train from Lübeck onto the Danish border. In essence, only women from Ravensbrück benefited by the efforts of the original action, of the"White Buses". To the instructions from Himmler, Suhren as commandant of the concentration camp strictly adhered to his orders which affected, apparently only female inmates, no males. Parallel to these actions was that of the representative of the International Red Cross, Albert de Cocatrix, who tried in vain to convince Suhren as commandant to transfer the running of the camp to his organisation until the arrival of Soviet troops. 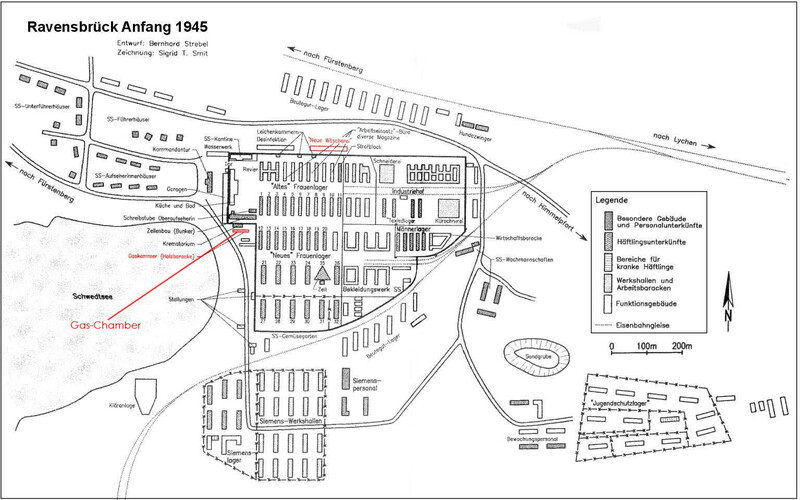 Suhren insisted on his orders and began with the evacuation of the Ravensbrück concentration camp on April 27 1945. At this point of time there were about, 18000-30000 prisoners in the camp. The women were forced to march, made up into several columns, each consisting of 800 inmates in a north-westerly direction. Prior to that, each of them had received even a Red Cross package. The last contingent to guard the prisoners consisted of men and women of the camp SS, from war-veterans and old soldiers and conscripted(zwangsverpflichtete) prisoners. On 28 April around 1400 hours, the last column left the camp. What remained behind, in total were 3000 sick, those unable to march, and some women inmate nurses and doctors. The prisoners were forced to march on several routes towards Neustrelitz and Malchow. Apparently the camp personnel was still hoping to get through the increasingly narrow corridor between the front lines to reach Schleswig-Holstein. Often up into the night, the columns of the weakened and exhausted prisoners dragged forward on overcrowded roads which were already in chaos coming close to war's end. They met civilians who fled before the advancing front, retreating Wehrmacht Units and returning forced labourers. All of them were exposed to low flying aircraft attacks. At night the women camped in barns, haystacks or outdoors. Their ordeal only ended in early May, when the various advance columns of Soviet or Allied troops arrived, and their own guards were gone. How many of the exhausted and debilitated women were still able to move or broke down and were shot by the SS is impossible to reconstruct. 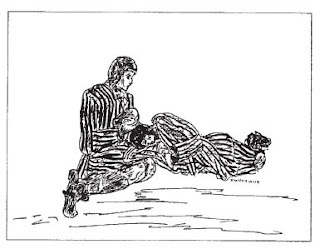 Some overseers and guards procured for themselves civilian clothes and in an unobserved moment left the column of prisoners, some others behaved neutrally towards the inmates. There were also SS-men in these closing days that continued with their murderous violence. 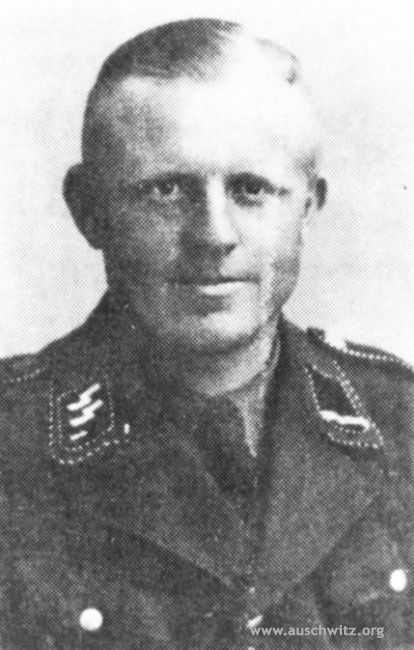 SS-Sergeant Albin Conrad was after the fifth Hamburg Trial sentenced to death, because he had caused a massacre during the death march. Conrad was on 28 April with a group of prisoners in the immediate vicinity of the main air-ammunitions plant at Neustrelitz-Fürstensee. Lisa Ullrcih who was then in this column of prisoners reported immediately after the liberation, that at kilometre marker 12.3 the air was shattered by an explosions. "The forest on the right side was ablaze. There was a terrible confusion caused by the air pressure that tossed prisoners back and forth, some on the left side of the forest scattered and each ran for his life. The munitions factory was blown up, and among the prisoners as well as the guards this caused confusion and panic". Charlotte Müller and Vera Maneke testified at the fifth Hamburg Trial that Conrad still in this situation, followed a group of women fleeing into the woods and shot eight or ten of them, others ran towards the lake and were able to hide there. After most of the evacuation columns came upon American and British Troops in the vicinity of Raben-Steinfeld near Schwerin many of the women survivors came back initially to Ravensbrück. The camps were occupied on April 30 1945 by the Russian 49th Army of the II Belorussian Front. Their doctors and nurses erected a field hospital there for the returning prisoners. Fürstenberger women and girls were conscripted to care for the sick and weakened women and men and were made to bury the dead. 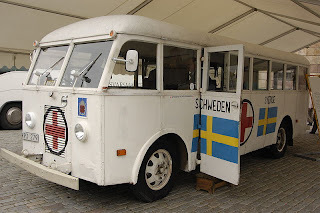 "White Buses" refers to a program undertaken by the Swedish Red Cross and the Danish government in the spring of 1945 to rescue concentration camp inmates in areas under Nazi control and transport them to Sweden, a neutral country. Although the program was initially targeted at saving citizens of Scandinavian countries, it rapidly expanded to include citizens of other countries. All told, the program removed 15,345 prisoners from mortal peril in concentration camps; of these 7,795 were Scandinavian and 7,550 were non-Scandinavian (Polish, French, etc.). In particular, 423 Danish Jews were saved from the Theresienstadt concentration camp inside German occupied territory of Czechoslovakia, contributing significantly to the fact that the casualties among Danish Jews during the Holocaust were among the lowest of the occupied countries of Europe. The term "white buses" originates from the buses having been painted white with red crosses to avoid confusion with military vehicles. The first section of the expedition departed Hässleholm on March 8 and boarded the ferry from Malmö to Copenhagen. Due to security, the Danish resistance movement was informed, but no problems were experienced - on the contrary, the expedition was very well received. On March 12, the first part of the expedition had reached its headquarters, Friedrichsruh castle, situated 30 km southeast of Hamburg. The castle was close to the Danish border and near the Neuengamme concentration camp, where the Scandinavian prisoners were to be assembled. Friedrichsruh castle was owned by Otto von Bismarck,[Otto von Bismark is buried there,sic] a friend of Bernadotte and married to a Swede. The expedition staff were lodged in the castle and a nearby pub, while the men established a tented camp in the park surrounding the castle. The vessels Lillie Matthiessen sailing to Lübeck with 350 tons of fuel and 6,000 food parcels for the prisoners, later the Magdalena, both from the Salèn shipping line. The force was divided into three bus platoons (each with 12 buses), one truck platoon (with 12 vehicles) and one supply platoon. Total transport capacity for the force was 1,000 persons for longer distances; 1,200 persons for shorter distances where the trucks could also be used. The buses used Motyl (a mixture of 50% gasoline and 50% alcohol) and had eight stretchers or seats for 30 passengers. They used 0.5 litres of fuel per kilometer (5.6 mpg); with full tanks they could cover 100 kilometers (62 mi). Each bus carried two drivers. To avoid publicity in the newspapers the Swedish state information bureau distributed so-called "grey notices" where the editors were instructed to avoid stories about the expedition. The Danish ambassador in Stockholm had offered a larger force (40 buses, 30 trucks, 18 ambulances and other vehicles). Bernadotte had considered a mixed Swedish-Danish expedition, this offer was turned down on February 23, due to the German requirement that the expedition force had to be Swedish. If not they could launch a full-scale attack on Denmark and Norway. The expedition had German liaison officers; the most prominent of them being Himmler's communications officer, SS Obersturmbannführer Karl Rennau, while Franz Göring was a liaison officer with the Gestapo. The expedition had around 40 German communication, SS and Gestapo officers. The Germans demanded that every second vehicle should have a German officer onboard. The "White Buses" expedition was totally dependent on cooperation with the Germans as the country under Nazi rule was a police state. Only with liaison personnel from the Gestapo and SS could the expedition move without restrictions. Bernadotte had promised Schellenberg to have the expedition in Warnemünde on March 3, but it was delayed by more than a week. The main reason for this was the difficulty in obtaining guarantees from the Allied forces to ensure that the expedition would not be attacked. At this stage in the war, the Allies had total air superiority and regularly attacked transport on German roads. The "White Buses" expedition would move mainly within areas controlled by the Royal Air Force. On March 8, the British government informed the Swedish foreign department that it was informed about the expedition but that it could not give any guarantees against attacks; the Swedish expedition was on its own within Germany. Some of the vehicles were hit by Allied aircraft, strafing the roads, killing one Swedish driver and 25 concentration camp prisoners. On April 8 some 100 Scandinavian female prisoners (including two French women) were collected from the camp and transported directly to Padborg in Denmark. At this stage Bernadotte had got permission to collect all sick prisoners. On April 22 a column with 15 Danish ambulances under the command of Captain Arnoldson departed from Friedrichsruh to collect the women from Ravensbrück. When the column arrived at the camp it was in chaos as it was to be evacuated due to the advancing Soviet forces. Arnoldson was told he could collect all French, Belgian, Dutch, and Polish women, a total of about 15,000. Arnoldson accepted, even though this was more than three times as many as the "white buses" could carry. The ambulances collected 112 sick women and on arriving in Lübeck, Arnoldson managed to inform Bernadotte that further transport was needed. He promised that all available resources would be mobilized. Two new columns arrived in Ravensbrück; one departed on April 23 with 786 women, mostly French, who were transported directly to Padborg. The second column collected 360 French women. The last columns arrived in Ravensbrück on April 25. The situation within Germany was rapidly deteriorating, with frequent shooting on the transports as the Allied forces continued advancing. In the camp a total of 706 French, Belgian, Dutch, and Polish women were loaded onto a column with Danish ambulances and lorries from the International Red Cross. On the way to Padborg this transport was attacked by Allied fighter planes, at least 11 were killed and 26 severely injured; the final number of fatalities was estimated at 25. The last column, led by Sub-lieutenant Svenson, had 934 women in 20 buses; mostly Polish but also French, American and English. The column rested during the night, was unsuccessfully attacked by fighter planes and arrived in Padborg on April 26, 1945. 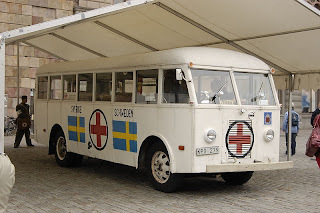 This was the last Swedish transport before Germany capitulated. 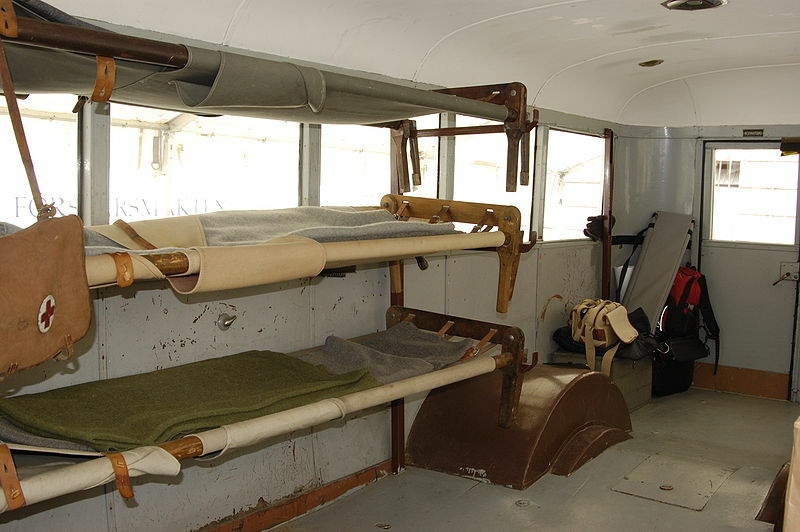 The Swedes were fortunately able to use a train - 50 goods wagons with 80 female prisoners in each wagon. The train departed Ravensbrück on April 25 and arrived in Lübeck on April 29. After the passengers had been fed, the train moved on to Denmark. A total of 3,989 female prisoners were rescued by this method. Within a few days around 7,000 female prisoners were evacuated from Ravensbrück to Denmark and then on to Sweden.According to the Swedish Red Cross a total of 15,345 prisoners were saved, of these 7,795 were Scandinavian and 7,550 from other countries. Around 1,500 German-Swedes were transported to Sweden. A total of 2,000 prisoners were transported from Neuengamme to other camps so that space was available for Scandinavian prisoners. 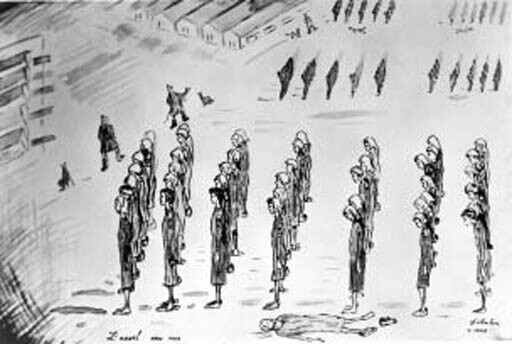 Four hundred French prisoners were transported from Neuengamme or left in Theresienstadt as they could not be delivered to the camp in Flossenbürg. The main reception station in Denmark was in the city of Padborg, on the border with Germany; the prisoners received food and medical treatment before they were transported through Denmark to Copenhagen. Transport to Sweden was by ferry to Malmö where the prisoners were received by Länsstyrelsen, (the county administration) and Civilförsvaret, (civil defence). Everyone that arrived was placed in quarantine, due to the risk of spreading infection. In all there were 23 billeting areas, most of them in Malmöhuslän with about 11,000 beds. Ambulating health centres, mostly manned by Norwegian and Danish doctors and nurses (themselves being refugees), took care of the prisoners. For some of the prisoners it was too late; 110 died after arriving in Sweden, most of them Polish. According to the Swedish Red Cross a total of 15,345 prisoners were saved, of these 7,795 were Scandinavian and 7,550 from other countries. Around 1,500 German-Swedes were transported to Sweden. A total of 2,000 prisoners were transported from Neuengamme to other camps so that space was available for Scandinavian prisoners. Four hundred French prisoners were transported from Neuengamme or left in Theresienstadt as they could not be delivered to the camp in Flossenbürg. The "white buses" expedition was a Swedish triumph that earned the country much goodwill, the return transports through Denmark were met by ecstatic crowds. On May 17 Count Bernadotte of Wisborg was on the balcony of the Royal castle in Oslo with the Norwegian crown prince. Between 1946 and 1948 a British Military Court held in Hamburg seven Trials, during which members of the SS administration staff, doctors, guards and prisoner functionaries were sentenced. Thus, among others, the last officer in charge Johann Schwarzhuber, the Head of the Political Department Ludwig Rahmdohr, the Head of the Tailoring Section Gustav Binder, the Doctors, Dr. Rolf Rosenthal, Dr. Gerhard Schiedlausky, Dr Walter Sonntag and Dr. Percy Treite were sentenced to death and executed.[Dr. Treite although sentenced death in fact committed suicide in Prison April 1947, sic] In court in Hamburg were also the Oberaufseherin Dorathea Binz, the warden, Margarete Mewes and the Block Elder of the Tuberculosis Blocks, Carmen Mory. While Binz and Mory were sentenced to death, the court imposed a ten year imprisonment for Mewes. Mewes was released on parole in 1952. In the Soviet occupation zone, before Soviet military tribunals several lawsuits took place during 1948 against guards of the concentration camp Ravensbrück. The defendants were convicted without any findings of individual guilt and sentenced to long prison terms, yet in the mid-fifties, they were either pardoned or released early. Other guards, who were immediately after the war interned in Soviet special camps had been handed over in 1950 to an East German court at Waldheim and there, in summary proceedings(Schnellverfahren), in disregard to the rule of law sentenced to long prison terms. Since 1948, East German courts proceeded within their states[Federal States,sic] of the Soviet zone of occupation their own investigations, mainly against former SS-personal that had been active in a number of satellite camps sub-ordinated to Ravensbrück. These judgements were considerably milder than that of the Soviet military tribunals or that of the judges at Waldheim. In the context of a growing political instrumentalization of the Nazi past by the East German courts they imposed later, much harsher penalties, as in the case against Christel Jamkowsky in July 1954, for crimes against humanity by the District Court of Gera and was sentenced to death, but in 1955 commuted to life imprisonment. The verdict was based solely on the confession of the accused. The allegations against Jankowsky was, that in 1943 during a target practice she shot about 60 detainees and participated in the killing of women and children with gas, but these accusation were not factually examined. Equally questionable was the last Ravensbrück Trial of the DDR, which took place 1965/66 before the District Court of Rostock. The former guards Ilse Göritz, Ulla Jürß and Frida Wötzel were sentenced to life imprisonment. There, too, the charges against them among other things, for participation in the killings with gas in 1943, although it had been shown, that a gas chamber at Ravensbrück concentration camp was not installed before 1945. In another, equally absurd series of experiments which came up at the Nürnberg Doctors' Trial that could not really be clarified as doubts were raised, was the operative removal from prisoners, of parts of bones, muscles and nerve tissues, apparently in order to test the possibility of transplants after wounds [that is injuries sustained in combat, sic] and to explore the regenerative potential of the body. 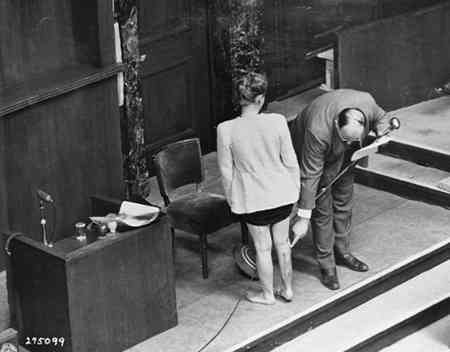 Jadwiga Dzido shows her scarred leg to the court at the Doctors Trial, while expert witness Dr. Alexander explains the nature of the medical experiment performed on her. The camp doctors from Ravensbruck, Dr. Gerhard Schiedlausky, Dr. Rolf Rosental and Dr. Herta Oberheuser conducted under the supervision of Gebhardt these experiments. Professor Gebhardt was convicted in 1946 for his activities and sentenced to death at Nuremberg, Herta Oberheuser received 20 years in prison and was paroled after eight years. Rosental and also Schiedlausky during 1946 in the Hamburg-Ravensbrück Trials were sentenced to death and executed. Unique in the history of Ravensbrück, is the protest campaign of the Polish women against medical experiments. The subjects were almost exclusively young women and girls from the Polish resistance, who were sentenced to death. In camp jargon they were called the"rabbits"(Kaninchen). When it was announced in March 1943 that trials were to begin again, despite assurances to the contrary, for a second series of experiments, the "rabbits", who themselves could by now only move on crutches, organised a protest march to Oberaufseherin(Superintendent) Langefeld, declaring that they would rather die than permit, that doctors commence operating on them again. Langefeld reacted helplessly. She had not known that the experiments would be resumed. According to Nina Iwanska who was a victim of the experiments and had organised the opposition, delivered a petition the following day signed by all the subjects to the camp commandant. In it, they asked the question "whether such experiments are provided in our judgements whose contents we do not know". The commander Suhren did not respond to this petition, curiously no attempts for further experiments did take place at that time. But on 15 August another ten Polish women were ordered to the infirmary. They refused, however, and hid themselves in Block 15. Only when the camp leader threatened to execute all the residents of the Block, the ten women came forward and were dragged into the bunker, five of them were immediately operated on. As punishment, Block 15 was cordoned off, doors, windows and shutters were shut and locked, and the prisoners remained there for three days and four nights without food, no light and little fresh air. Thereafter, there were no further operations that took place. Yet the SS in the fall of 1943 did shoot ten of the women that had been operated on. The rest were assigned to various work details, all enjoyed the protection and sympathy of the other prisoners. During this time some of them were able to document the crimes of the doctors and sent secret messages in different ways outside. The "almost unanimous support"was best demonstrated in January and February 1945, when the forced re-operated women were threatened again with execution. Nina Iwanska remembers that the "comrades of the Red Army"[the Russian women, sic] cut off the power supply for the entire camp to stop the morning roll call. As guards and camp police then surrounded Block 24, the column of morning-coffee collectors deliberately instigated a commotion which enabled the "rabbits" to escape. 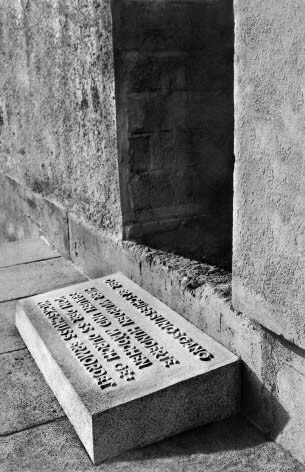 With the help of Blockätesten(Block-Elders) and the people engaged in the political department as writers, they replaced the numbers of dead prisoner comrades for those that got away. Nevertheless, the game of hiding inside the camp became more and more dangerous. "That's why we took the decision," said Nina Iwanska, "that eighteen of us should go with the various transports to relieve the daily problem, to enable to hide those in Ravensbruck, who could no longer walk. Drawing by France Andoul "Your Hour Has Come"
Hermann Göring's letter dated 13.7. 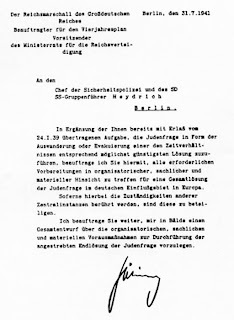 1941 to Heydrich outlining the Order for the Final Solution of the Jewish Question, which initiated the Wannsee Conference code named "14f13"
According to statements of prisoners, the first transport left the camp on February 3, 1942. On the following day a truck returned with the clothes of the women that had been on that transport with prison numbers and tri-angles still attached. Bags(Beutel) with meagre belongings, crutches, prostheses and dentures were unloaded and sorted. "The ambulance therefore took them to their deaths". This terrible news ran through the camp to the hundreds who now expected the same fate. In February and March another ten so called"black" transports took prisoners into the Healing and Nursing Home at Bernberg. The exact destination of the transports became known to the remaining prisoner only through Olga Benario-Prestes, who was sent away with one of the last transports and had concealed a message in the hem of her dress. After the cessation of the murder-action "14 f 13" the sick and weak prisoners in the camp were killed with phenol and morphine injections. Germaine Tillion reports of about 60 "black" transports with 50 to 70 female prisoners from Ravensbrück in 1943/44 that went and were killed at the Austrian Euthanasia Facilities at Hartheim near Linz. She based this figure on information provided by paramedics and doctors at the camp's Hospital Blocks. 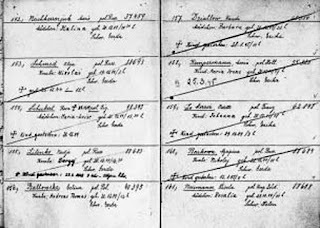 In the Day Books (Tagebücher) of Ravensbruck only one transport of 120 women in November 1944 is reported as taken to Hartheim. At the same time another group of sick and weak prisoners were deported to the concentration camps of Majdanek and Auschwitz. 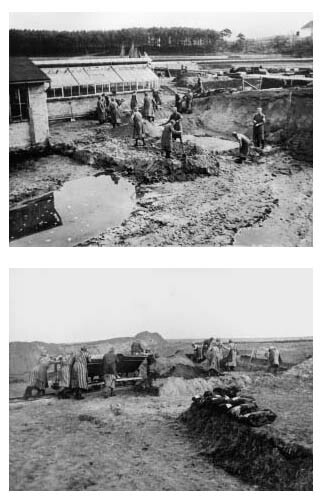 When the Red Army was advancing on these camps in the east which had been gradually evacuated, the SS sent the incapacitated men and women from Ravensbrück to Mauthausen and Bergen-Belsen. Schloss Hartheim was one of the Nazi "Euthanasia" killing centres where the physically and mentally disabled were killed by gassing and lethal injection as part of the T-4 Euthanasia Program. The "Euthanasia Institute" was located in the castle of Hartheim, Austria. After the World War Two, the building was converted into apartments. The gas chamber was open to visitors, beginning in 1969. 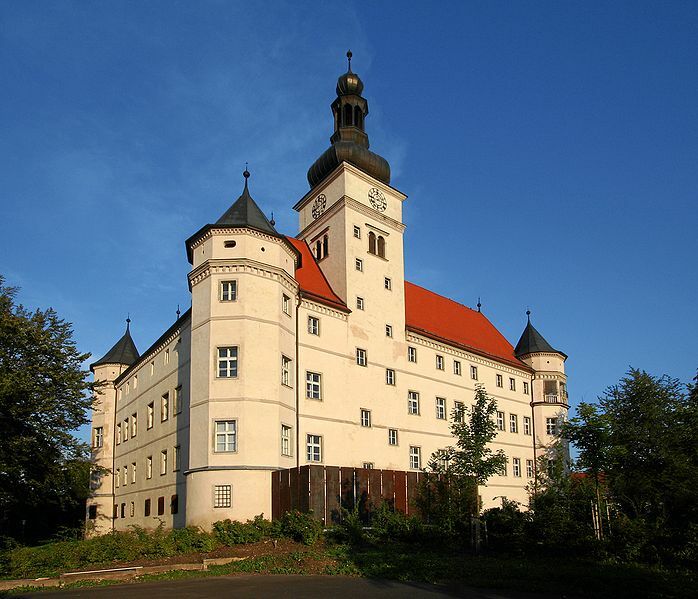 Hartheim Castle is now a Memorial Site dedicated to the thousands of physically and mentally handicapped persons who were murdered here. But there is another group of victims: in Schloss Hartheim over 8,000 prisoners of the Dachau and Mauthausen concentration camps were sent here to be gassed. In the last phase of total congestion (Überfüllung) in Ravensbrück the SS set up themselves facilities for anticipated deaths in the camp which did eventually and deliberately or naturally occur . Sick and the old women had been given a few weeks earlier pink cards which were supposed to relieve them from hard work. In January 1945, the SS provided the barracks 27 to 32 for these affected people, which had been separated by barbed wire from the rest of the camp. 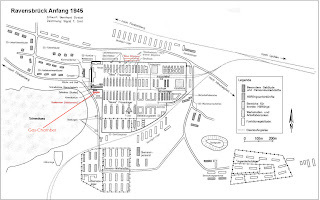 From there, the women had to line up daily on the parade ground in columns and march on foot about a Kilometre away to Uckermark, which had until then served as a "youth camp"(Jugendschutzlager) for maladjusted(unangepasste) girls. One part of this camp was sealed off with barbed wire and at the beginning of 1945 was turned into a selection unit for an extermination camp(Vernichtungslager). There, disastrous conditions prevailed. The women received only half rations. The guards took away blankets, jackets and stockings, and they had to stand at attention on roll call almost all day. The Austrian Communist Irma Trksak who had been demoted as a room senior and sent there as punishment, said: "Then the women realised what they had actually in mind for them, to kill them in more than one way, if at all possible, by starving, they should freeze to death, they should become sick, so that they would have died of "natural"causes. Before she was able to return to the main camp, Irma Trksak could observe that women in the Uckermark camp infirmary were given a white powder that was administered after which they died in agony. Apparently, the camp administration had received instructions regarding a pending evacuation of the camp to kill all non-labour and those not capable of marching prisoners as quickly as possible. The original of this order, it is claimed that apparently had been seen by an inmate clerk in October 1944 on the desk of the protective custody camp leader, has not been found until now. [Stanislav Zamecnik was able to reconstruct, however, the existence of a corresponding command from Himmler for Flossenbürg and Dachau: "No prisoner must fall live into the hands of the enemy". [On the existence of this Himmler command, 14/18 April 1945, see Dachauer Hefte, pages 219-231, sic] However, there is no doubt that murder has been systematically committed in Ravensbrück since the beginning of 1945. Simone Erpel contradicts this analysis during her investigations of the last phase of the war in Ravensbrück, the claims by Bernd Weisbrod and Bernhard Strebel, suggesting that the women's concentration camp during this time took the character of an extermination camp. She argues that the last war year, certainly represented a turning point in the history of the camp but that it could not be spoken of a change in its basic functions. Ravensbrück did, in spite of gas chambers and other forms of mass killings, not become an extermination camp, the dominant character as a place of forced labour was preserved. At the beginning of 1945, together with Johann Schwarzhuber came SS Master Sergeant(SS-Hauptscharführer)Otto Moll and a detachment of a six-member commando from Auschwitz to Ravensbrück, [this statement is made by Strebel, KZ Ravensbrück page 476ff, sic]an experienced specialist in mass murder. Moll apparently performed previously mass shootings at camp Uckermark, but very little is known or could be proven. Apart from that, he organised the mass murder in a rapidly built gas chamber at Ravensbrück. Prisoners from the men's camp built in January 1945 near the crematorium a wooden hut for this purpose, and shielded it by a high fence from view. A commando of male prisoners had to burn the corpses. These inconvenient witnesses were killed on 25 April 1945 in the bunker. From calculated estimates at least 5000-6000 women and men died from early January to late April in the gas chambers. Germaine Tillion reported that since mid-January, women in groups of 50 to 60 people were trucked in from the camp of Uckermark and driven directly to the gas chamber, this figure increased between 150-180 prisoners daily as from March. The SS leadership made every ​ effort, to keep the existence of a gas chambers secret. Therefore, against the names of listed victims the note: "rest camp Mittwerda" was entered in the register. 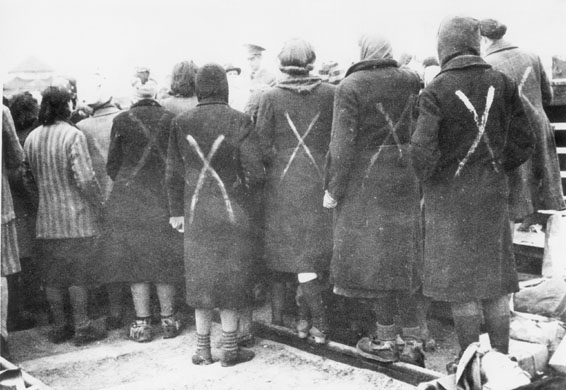 [Women prisoners working as scribes counted a total number of names on lists for "Mittwerda" as 3.660, the codename for the Nazi gas chamber.sic] The rumours about the fate of the selected spread quickly, mainly because their clothes were already returned a short time after a transport to the camp. Admittedly, there is no certainty about the nature of the murder, as no prisoner from the main camp ever saw the gas chamber, but there was no doubt that a pink card meant death. In the selection process harrowing scenes were played out. Irma Trksak relates: "We made the old women blacken their grey hair with shoe polish and said: "You must try to make some steps, you must walk and do everything so that you can show them you can manage on your own". Germaine Tillion, characterises the selection as "true cross-hunt" that went through the entire camp, during which the SS would pick all women who like her, were not in a workplace for the gas chamber. "I was warned in time, I could hide". Tillion, who was then very ill, did miss the selection on 16 March, because she was able to hide in a bed in the infirmary by Margarete Buber-Neumann. Her mother, however, was picked up on that day and killed. 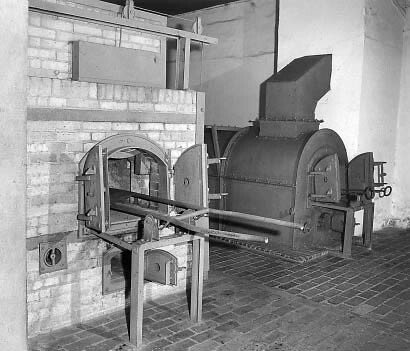 That "Mittwerda" was the codename for the gas chamber has not been disputed in the Hamburg Ravensbrück Trials from 1946 to 1948 by any defendant. Nevertheless, on this subject there remain some unresolved issues. It's not about the actual number of those that were killed or the poison that was used there. It is not yet known or any available evidence that mobile gas vans for exterminations were ever put into operation. Also on the time frame of the beginning and end of the executions, there are various different opinions. In some reports it is mentioned that the last action took place on March 30, 1945 and then the interior of the gas chamber was blown up by the SS. 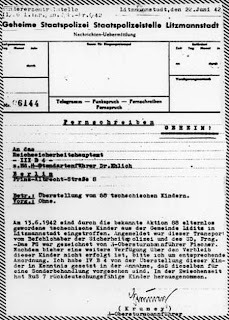 Erika Buchmann, who was then the block elder in the tuberculosis barrack reported, however, that even on 23 April 1945 18 TB patients were taken to the crematorium. The Frenchwoman Marie-Claude Vaillant-Couturier, wrote in her diary that until April 25 or 26 selections had take place and prisoners were murdered. The French survivor Ansie Postel-Vinay said therefore, one has to assume that it is very likely the blowing up of the building in early April was that of the modern brick gas chamber construction under the code name "New Laundry"(Neue Wäscherei) which was never put into operation and some evidence of this does exist. The "Neue Wäscherei" Just outside of the northern camp wall is the site of the todays memorial. 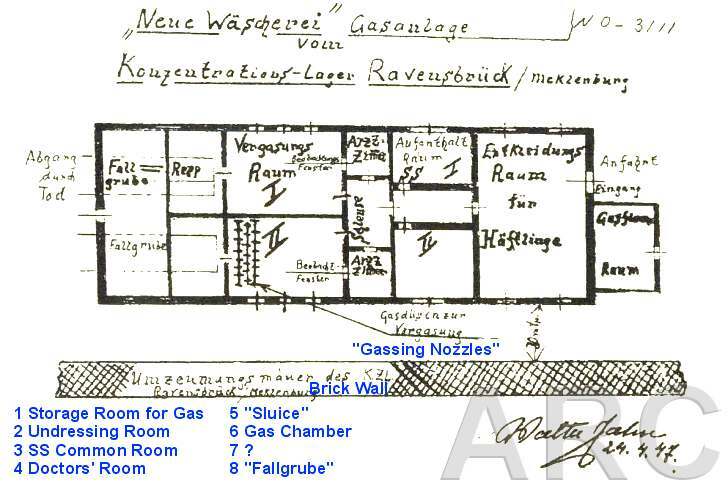 Near the former "Revier" there is a building that was most probably erected to serve as gas chamber (with two rooms). It is the socalled "Neue Wäscherei". The construction works started in October 1944 but were delayed, probably because of a lack of material. Because of the situation at the front in late January/early February 1945 the camp authorities had to find a temporary solution for gassing purposes. It is also possible that the prisoners who had to build the "Neue Wäscherei" gas chambers delayed the works intentionally so that this killing facility never went into operation. One can assume that the former Auschwitz commander, Rudolf Höß (in his capacity as chief of the WVHA office DI), together with his superior Oswald Pohl and camp commander Fritz Suhren; inspected the construction works between end of February and mid March 1945. This was witnessed by Walter Jahn who had been imprisoned in the men’s camp since 1941. As an electrician he had to install cables in the "Neue Wäscherei", and testified against Pohl in Nürnberg. In addition he drew a sketch of the gas chambers for the court. There are also testimonies from usually reliable witnesses about the use of mobile gas chambers or the installation of a gas chamber in an adapted Dutch railway wagon that was parked in a pine wood behind the so called "Siemenslager". However these statements are questioned by some researchers. 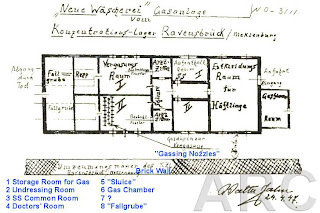 It is notable that defendants of the Ravensbrück trials (altogether seven trials) freely mentioned a gas chamber in the "former barrack" but never mentioned another gas chamber (in the "Neue Wäscherei"). For the Gas Chamber Barrack no plans or remnants of the building are available. 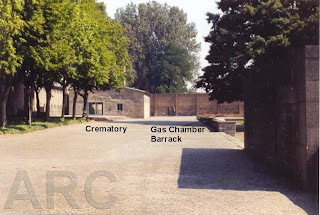 Therefore all facts about this real gas chamber of Ravensbrück are based on the testimonies from witnesses (SS men and former prisoners) who all agreed about the type and location of the gas chamber. This provides firm evidence to support the existence of the gas chamber. It was installed in the warehouse barrack of the Malerkommando (painter’s command) that was located directly beside the crematorium. The barrack was emptied and then sealed. The gas (Zyklon B) was poured into the gas chamber through an opening in the ceiling. 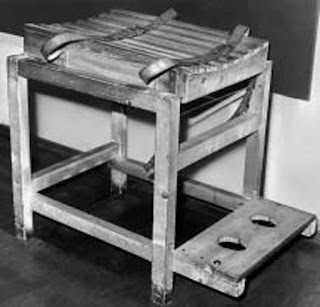 Some witnesses stated that this has been done by prisoners but this can be doubted because the SS usually did it itself. According to witnesses one side of the gas chamber could be turned down to facilitate the removal of the corpses and the ventilation. Others talked about double doors. To hide the crime a two metre high fence was built around the barrack. A few metres away from the barrack a small shed was located. Here the victims had to undress before the SS drove them to the gas chamber. It is not clear if SS doctors were present at the gassings. In the night of the 23 April 1945 the barrack was blown up by the SS, according to some witnesses. Therefore no important traces remained after a few days when the camp was liberated by the Red Army. In contrary other witnesses stated that they still had seen the barrack shortly after the end of the war. We don't know if the foundations of the barrack are still there: The site where the barrack was located, was converted into a DDR (East Germany) memorial after the war. It became a part of the graves field at the camp wall. An archaeological inspection to locate the exact site of the gas chamber would disrupt the today’s graves. A positive result would not be predictable anyway. Among the first buildings that were erected on the grounds of the women's concentration camp, was one of the cell blocks. 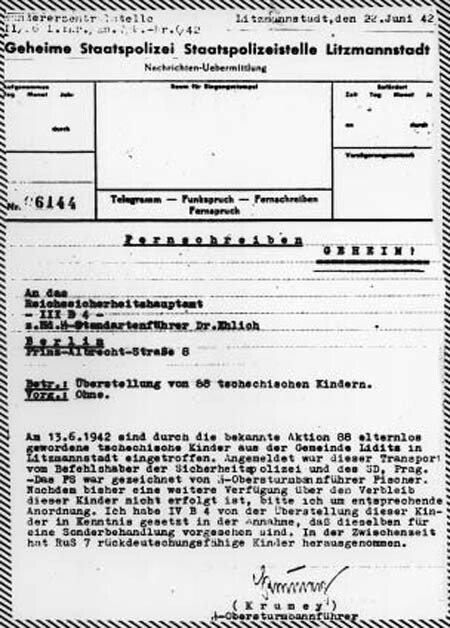 Camp commandant Max Koegel had specifically made inquiries with the Inspection of the Concentration Camps in order to proceed, for the need for a prison building: it is impossible to maintain order in the camp, he wrote, "when these hysterical women[he used the German expression "Weiber" not "Frauen' which is somewhat derogative,sic] full of spite can not be broken by strict confinement because the women's camp has no other severe penalties that may be applied". Apparently Koegel played on the fact that officially at the beginning in Ravensbrück there was no corporal punishment allowed, this did not prevent the overseers, however, to beat and harass women every day. 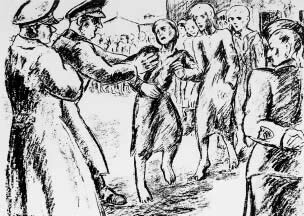 But in January 1940, after a visit of Reichsführer SS Heinrich Himmler to Ravensbrück, was flogging (25 lashes or strokes as in men camps), allowed for female prisoners. Beatings took place twice a week in the cell block, where the women were strapped to a Block. "The Punishment Block", where inmates were strapped into, to receive Lashes or Beatings with a Stick. After another order (Erlass) since July 1942 from Himmler, "stringent corporal punishment"could also be imposed on women, this meant blows to the naked buttocks. Wanda Kiedrzynska remembers that the beatings until July 1942, was done by the female wardens Hasse and Binz, after that there were prisoners who volunteered and carried out this task for an extra ration of bread. Then on 2 December 1942, a decree for all concentration camps was issued, which limited the use of corporal punishment considerably to some extent. 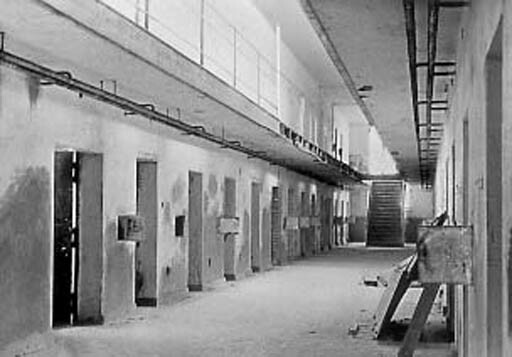 Apart from the threat of confinement in the bunker, the stick or strapped to the block, prisoners would receive other forms of penalties: Hour-long standing at attention in front of the office, in the worst case, from evening to morning roll call, hair being shorn with scissors, deprived of food for the entire block, detention in the prison or sentencing to the criminal block, where shortened food rations and increased harassment particularly heavy work had to be performed. The arrest period into the Camp Bunker was usually seven to 14 days. The women were given at this time only one Lunch (Mittagessen) every three days, and a blanket. 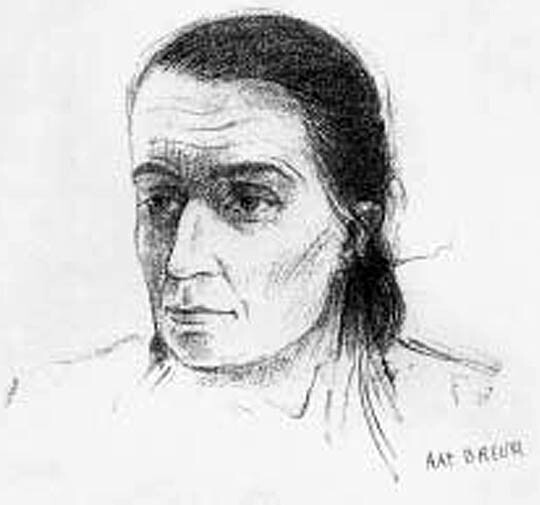 Margarete Buber-Neumann was in the spring of 1943 after the replacement of Ms.Langefeld in a dark arrest cell, among other reasons because she had suppressed as a writer of the Oberaufseherin reports of rule violations of other prisoners. When she was discharged after a total of 15 weeks, she was completely exhausted and hallucinating. "The light was hateful to me and the awful reality. I wanted to close my eyes and return to my fantasies," she wrote. 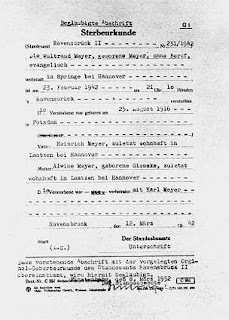 Wanda Kiedrzynska reported that about 350 Jehovah's Witnesses after they had refused in December 1939 collectively to pack Christmas packages for German soldiers, were kept for three weeks in the Bunker, in unheated cells without jackets, hygienic pads, any garments, blankets or the usual straw-mattresses. 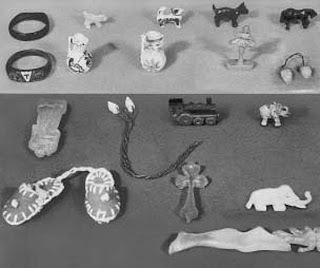 When, on 9 January 1940 they returned to the barracks, many of them had frostbitten noses, ears, hands and on legs. Punishment was arbitrary for any expression of life from "arm-in-arm walk" on the camp road, or the writing of poems, to be found in another block up to the theft of food or material taken from the factory. For Sabotage in armament factories was punishable by death. In a secret circular to the commandants of all concentration camps on 11 April 1944, it was ordered to hang publicly those convicted of sabotage in he camp grounds. According to Wanda Kiedrzynska however, she found that in the women's camp at Ravensbrück no public executions took place on the gallows. Those women that were sentenced to death, were killed outside the camp wall with a shot to the neck by small calibre weapons. Survivors among prisoners recalled a sand pit in a nearby wooded area as the execution site. Other executions have taken place in the immediate vicinity of the crematorium, because the prisoners in the camp heard shots from there. 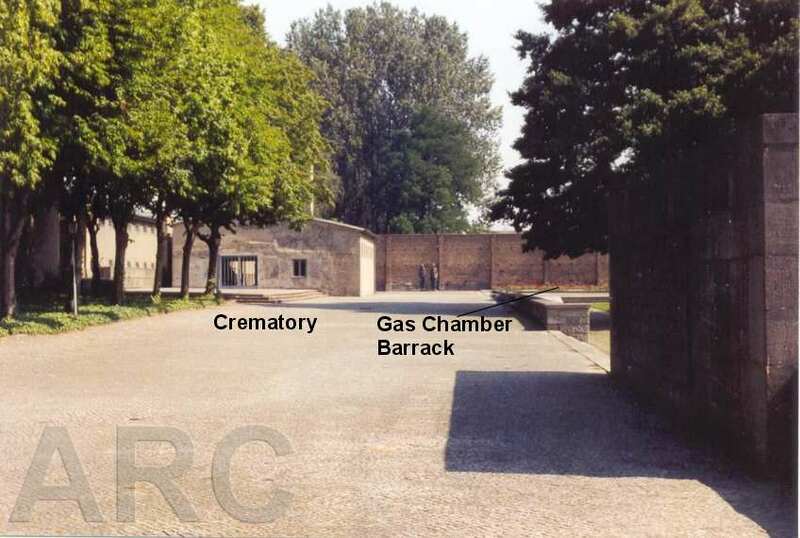 But if the narrow space between the wall of the cell building and the garages, which is now referred to, at the the memorial site with a plaque as a "shooting course"(Erschießungsgang), actually served this purpose is questioned in more recent investigations. Similar to the other main camps, the Cell Building (Zellbau) in Ravensbruck had several functions. It was the camp prison, interrogation and torture place for the feared head of the Political Department, Ludwig Ramdohr. It also served as a prison and execution site for prisoners who were deprived of the regular courts and were subject only to the RSHA jurisdiction. This affected the resistance fighters from occupied countries, who came under the Nacht und Nebel (Night and Fog) decree under strict secrecy to Ravensbrück. It also affected many other special prisoners of the Gestapo: Collaborators of enemy intelligence agencies, and prominent prisoners, family detainees who were held as hostages. Particularly noteworthy are the men and women of the resistance group of 20 July and their families. The "Special Commission Lange", which was involved in the investigation after the assassination attempt on Hitler resided in the Security Police School Drögen at the other end of the town of Fürstenberg. There, the prisoners were brought in for questioning, but in some ways still civilised as the relatives came to Drögen and were able to visit them. Ramdohr was feared for its brutal methods of interrogation in the camp. In the spring of 1945, Ramdohr because of the maltreatment of a female Polish prisoner, and the unauthorised contact with a prisoner was arrested on 20 April 1945 and sentenced by an SS and police court in Berlin to six years imprisonment. Ramdohr allegedly extorted from prisoners false confessions in order to pursue criminally members of the SS. For his rehabilitation Ramdohr was transferred to a penal probation battalion and moved to the front. a) It is a fact that the food for prisoners on remand had been shortened. c) I have beaten prisoners. Ludwig Ramdohr was on 3 February 1947 sentenced to death. In spite of a request for clemency the death sentence by hanging on 3 May 1947 was enforced. An unidentified companion drew this portrait of the Daughter of the Czech inmate and Health Care Professional Zdenka Nedvedova, she was only allowed for a few hours to keep the photo of her daughter which she had received. Already in June 1939, 14-16 year old boys and girls entered the women's concentration encampment. These were Roma's from the Burgenland in Austria, who had been rounded up along with their mothers and later deported from Ravensbrück to Auschwitz. Also, Russian, Ukrainian, Czech, Polish and German children were taken in, sporadically until 1942. During 1943, transports of children and their mothers with Turkish, Hungarian, Romanian, Spanish and Portuguese passports arrived. These were Jewish women with their daughters and younger sons, who had lived within the bounderies of the German Reich or from occupied countries by German Forces and had the nationality of States, that were allied (verbündet) with Hitler-Germany. Once the scope of the National Socialist Jewish policy[Die Judenfrage,sic] could be extended to these persons, they were deported to Ravensbrück from the Germany, Belgium, the Dutch transit camp Westerbork and the city ghetto of Theresienstadt. Larger groups of men with children came after the defeat of the Warsaw uprising in late 1944 to Ravensbrück. Also with the clearance of sub-camps around Auschwitz and the deportation of Hungarian and Slovak Jews from these countries in late 1944 early 1945, women with their children entered the camp. The children had, like all other prisoners, stand for hours every day on the parade ground. From 12 years on, they were used, along with the adults doing work shift in the Rüstungsbetriebe (armament factories). The boys were separated from their mothers and came into the men's camp where they had little chance of survival. About living conditions and accommodation for the smaller children, there is conflicting information. The Czech inmate physician, Dr. Zdenka Nedvedova-Nejedlá said in one of the Hamburg Trials, the children had slept in Revier (Hospital) area number I in a separate room. As their numbers grew, however, they were taken in January 1945 with their mothers into the block 32. 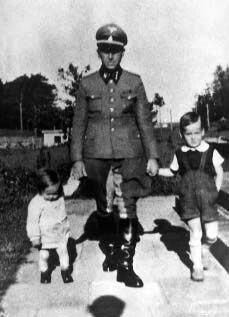 Bernhard Strebel in an unspecified time frame an approved arrangement from headquarters that children were under 14 years were taken (apparently without their mothers) into a separate block, where they did receive daily one Liter of skimmed milk. The secret lessons so Strebel claims, where Polish Children who had participated in classes there, was then only possible in exceptional cases. However, the children were alone if the mothers had to work. Charlotte Müller remembers the days that the children could not leave the block, had to stay quietly in one corner of the day-room, toys were not allowed. They were at the mercy of the SS-Aufseherinnen(SS-Wardens). Rita Sprengel watched children playing in the camp street " roll call" or "gassing." The concentration camp was not set up for the births of children. In the first years of its existence, pregnant women were taken for their delivery to the Templin hospital. The fate of these children has not been explored. Presumably they were put into homes of the NS-People's Welfare (NS-Volkswohlfahrt), their mothers had then returned to Ravensbrück. According to statements of prisoners since 1942 children were born in the camp as well. 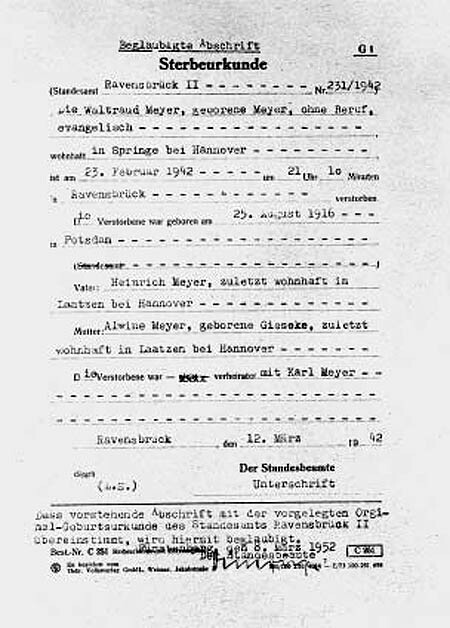 Although a decree of the Chief of Security Police and SD, Ernst Kaltenbrunner, on 6 May 1943, forbade the acceptance of pregnant women into Ravensbrück, yet during this time more than often women, who were expecting a child, arrived with transports from Auschwitz and Majdanek. The SS doctor Rolf Rosenthal and the prison nurde Gerda Quernheim got rid of the problem in another way: They performed abortions, often even in the ninth month, or they killed the new born. In 1943, the gynaecologist Dr. Treite replaced Rosenthal, under im the new born were not systematically killed, but their chances of survival were still low. The number of births increased by the end of 1944 after the Warsaw Uprising, many pregnant Polish women came to Ravensbrück. From September 1944 to April 1945 560 children were born in the camp. 104 of the entries in the register of births are not crossed out. But this means only that the infants did not die in the first few weeks. About half of them were sent along with their mothers in March 1945 with a transfer to Bergen-Belsen. According to the testimony of the former prison nurse Hidegard Brand during the Hamburg Trial all the children lost their lives, many of them died already on the transport. In spring 1945 more transport of mothers with children were sent to certain death. 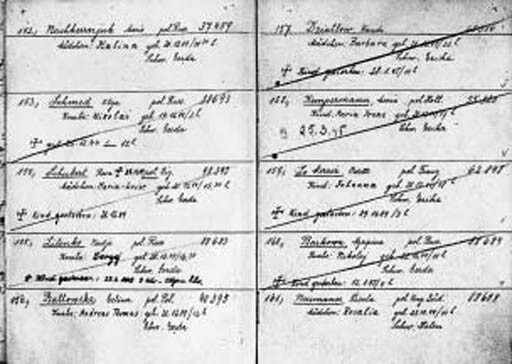 Register of Births, all except three have been crossed out, one has to assume that the other new born died or were killed. 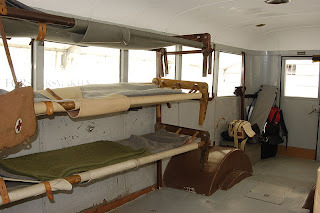 During the hight of expecting births, inmate Lisa Ullrich at the insistence of mothers became block leader in 1944 and furnished a "Mother and Child" barrack. Her "people" were- a Czech Paediatrician, a Czech and a German woman doctor and a baby nurse - which she herself had selected. About 150 pregnant women of different nationalities, more than 100 mothers and 96 infants were there to care for at that time. "We vowed to do everything in our power to get the kids to a "save" place", Lisa Ullrich wrote later in her memoirs. Even so, in this environment the lack of necessities of life, for all the babies to survive was almost impossible. In the second half of March of 1945 as part of "Operation Bernadotte" the first "white buses" of the Swedish Red Cross arrived in Ravensbrück, for women from Scandinavia, Holland, Belgium and other Western countries to go to Sweden. 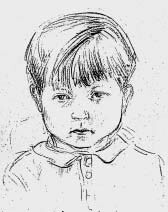 On 11 March 1945 The Frenchwoman Pienotte Poirot gave birth to a son. She cried bitterly that she could not go to Sweden with a new born: "With my mates, we discussed how we could help Madame Poirot and her young son[ ... ] I then told the mother that we would have to report that the child had died. [...]. The little guy, we would make ready, wrap him into a blanket, folded and tied like a package that would look like the little bundles of other women. Once we learned the women went to the gate, I would bring the package to the gate[ ... ]We organised an observation post. But the evacuation was delayed by several days. We had a terrible fear and anxiety, the tension was almost unbearable. Then came the command for the French women to line up, names were called out and compared with the lists. Everything worked. The women went to the camp gate. Now the sign was given to us. I took the bundle in both hands and had only one thought: 'if only he did not cry!'. I reached the gate, called out to the guard that the woman had forgotten her luggage, handed it to the mother. 'Madame, the baggage' I said quickly. Soon she was out to the camp gate". - Guy Poirot is now a teacher in Paris. He visited Ravensbrück in 1975 with his family. Ullrich, Lisa. Born 1900 in Odessa - died 1986 in Berlin. Worker, Communist Party functionary. Arrested in 1933 and kept in custody until 1935 convicted and kept in Jauer prison until March 1936, after "protective custody" in Moringen, Lichtenburg, Ravensbrück, as prisoner No. 108 (1939) / 58 292 (at the end August 1944). Released in May 1939 in Berlin. Re-arrested 22nd August 1944 and transferred to Ravensbrück, after liberation politically active again. The Dutch women Anni Hendrik, whose husband was shot, gave birth on 19 February 1945 to a son whom she named Behrend. Behrend was the first child to be born in the "Siemens Camp". Yvonne Useldinger from Luxenburg wrote on March 6 in her diary:"The child is in our barrack. Words are missing to express all the feelings, the people have become raw (sind roh geworden), the kid is too reminiscent of people who inspire pity, we keep the mother and the child. From my scarf with wire I knitted a jacket". Few children born in Ravensbruck, who survived the camp, who had come into this world in the last weeks before the liberation had the good fortune to be included with the transport of the Red Cross to Sweden. 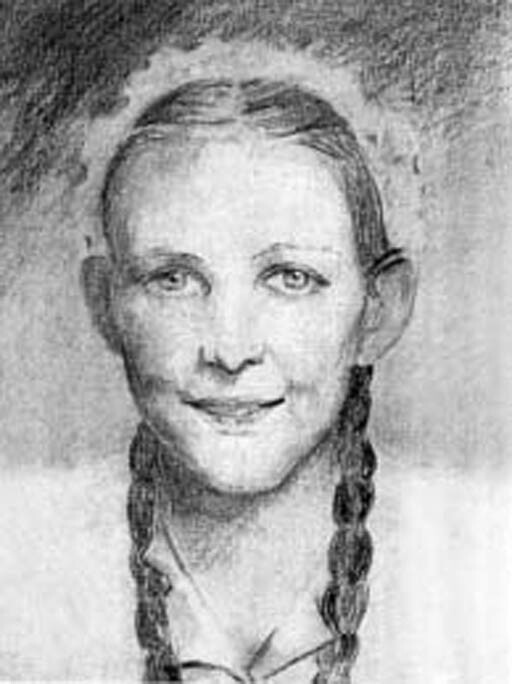 The son of Annie Hendriks died on Swedish soil, however, shortly after its evacuation.